What is the future for the India-Europe relationship in the coming decades as China narrows its relative power differential with respect to the United States? Going by contemporary experience, the unfortunate answer is perhaps “nothing more than a transactional relationship”. Yet there is much to suggest a closer strategic relationship: both from the perspective of ensuring liberal, democratic norms remain pre-eminent across the world, to convergence of interests over issues of global governance to addressing common security threats like international terrorism. Absent a grand narrative connecting these dots into a coherent pattern of a strategic relationship, it appears that India and Europe will continue to remain on two sides of transactions, albeit an ever growing number of them. As we construct a comprehensive geopolitical vision for India in the twenty-first century, I am struck by the relative poverty of the India-Europe agenda. My thesis of India being a geopolitical swing power between a still pre-eminent United States and a rising China argues that India must develop better relations with these two than they have with each other. It also indicates that New Delhi must develop a broader geopolitical leverage on a number of issues that can compel the United States and China to ensure that India’s interests are protected. While I can envisage what this entails for India’s policy towards East Asia, Central Asia, Russia, the Middle East and Africa, I do not clearly see how what it means for Europe. This is partially due to Europe’s own foreign policy course over issues ranging from commitment to stabilising Afghanistan to the enlargement of the European Union, and indeed, with its approach to handling an increasingly diverse demographic. Will Europe be so pre-occupied in evolving its domestic order to be a potential partner for India in the geopolitical space? How much will Europe compromise its liberal democratic values in order to accommodate geopolitical pressure from China and its Eastern periphery? Even if Europe and India agree on the definition of common problems, will their respective internal political dynamics allow them to see eye-to-eye on the solutions? Moreover, does there exist in Europe a school of strategic thought that sees a partnership with India as necessary for addressing the challenges of the twenty-first century? Today’s Pax Indica column was translated from the original Malayalam, today’s global lingua franca, into a fringe Western European language called English so that people in the past could learn about the future of their great nation. It was Jagmohan Mehta, a bright spark from Navi Pune (then called Boston) who first raised the famous slogan, “No Taxation Without Representation!” If the Indian government wanted to tax NRIs, he argued, it must also give them the right to vote, and seats in the Indian Parliament. Such was the simple force of this argument that in less than a week, it was a ubiquitous banner on the blogs (a quaint early twenty-first century form of self-indulgence) of NRIs around the world. In sympathy, activists fighting for the independent sovereign Liberal Republic of Bombay suspended their agitation and lit their perfumed candles for the NRI Cause instead. Members of New Delhi’s civil society–some say as many as fifty–turned up in large numbers to express support for India’s growth to be inclusive of NRI taxes. The third United Progressive Alliance (UPA 3) government, under Prime Minister Kapil Sibal, immediately constituted a Empowered Group of Ministers with Civil Society Participation (EGOM) to study the demands and propose recommendations in a time bound manner. The EGOM supported the idea of creating a new type of political unit called the Extra-territorial State of India. It was a remarkable idea: the Extra-territorial State need not be part of the sovereign territory of the Union of India. It could be just about anywhere. As long as there were sufficient numbers of NRIs located in any geographical region anywhere in the world, that region qualified to be an Extra-territorial State of India. It was decided, over a particularly animated tea-break, that a sufficient number of NRIs for this purpose was 96,580. It was decided that Extra-territorial States would be treated on par with territorial States in every way. They would form their own governments, have past-their-prime-but-loyal-to-party politicians as Governors, the authority to legislate over subjects in the State and Concurrent lists and participate in Ranji and Duleep trophy tournaments. (IPL, as you know, follows a different process of admitting teams). They would get funds from the Centre to implement programmes named after Nehru and various Gandhis, including NREGA. They would also elect representatives to the Lok Sabha based on the population, with one Lok Sabha MP for every 96,580 persons. Rajya Sabha seats were calculated by some weird logic no one really understood, but since each Extra-territorial State would get at least one Rajya Sabha seat, no one really complained. Thus was created the first modern global nation-state of which there are so many today. But in the early 21st century it was a novel experiment. Most people agreed it would collapse within a decade. How could a nation with so much diversity and so vast a spread hold together? Little did they know how wrong they would be. New Delhi, it is reported, has shortlisted two European vendors for its long-drawn procurement of fighter aircraft for the Indian Air Force. Now, military analysts can have endless debates and even objective opinions on which among the American, European and Russian aircraft is technically superior and better suits the stated requirements of the IAF. Financial analysts can have similar debates and objective opinions on which is the cheapest or the best value for money. These opinions may or may not converge. But when you are buying 126 planes worth more than $11 billion dollars, you are essentially making a geostrategic decision, not a narrow technical/financial one. The UPA government’s decision to reject both American proposals, of the F-16 and F/A-18, demonstrates either a poor appreciation of the geostrategic aspect or worse, indicative of a lingering anti-American mindset. While the US ambassador has resigned, whether or not it will prove to be a setback for India-US relations remains to be seen. Damaging the careers of pro-India American officials is a silly thing to do. This move will most certainly reduce India’s geopolitical leverage with the US military-industrial complex, at a time when India needs it most. From the unfolding dynamics in the Afghanistan-Pakistan region, to the changing balance of power in East Asia, to UN Security Council reform, to a number of geoeconomic issues, the United States can take positions that can have long-lasting consequences for India’s interests. Is the United States more likely to be sympathetic to India’s interests after a $11 billion contract—which means much needed jobs for the US economy —is awarded to someone else? Long used to complaining that the United States doesn’t care for India’s interests, will awarding the contract to some European firms help change the situation? The argument that the European bids were ‘technically’ superior are not entirely credible either, for two reasons. First, at sufficiently high levels of technology, the difference between the planes on offer is marginal. To suggest that the European models are vastly superior defies logic, because some of the world’s most powerful air forces are flying F-16s, leave along F/A-18s. Second, the notion that combat requirements can be perfectly defined at the time of procurement is false. It is the combination of man and machine that wins battles. The focus on machines ignores the reality that much swings on the man flying it. Moreover, given the nuclear deterrence relationships obtaining in the subcontinent and across the Himalayas, those planes might never see an aircraft-to-aircraft dogfight in their lifetimes. For other tasks like air support for ground operations, the specifications are even lower. What about those alphabet soup agreements and fine-print contracts that the US insists that India sign, that might prevent the planes from being used when needed? Those who make these arguments do not understand what war means. War means all bets are off, and India will do whatever necessary to protect its interests. While the existence of those agreements was a usual bargaining chip for India, to get a discount, to believe that such arguments will hamstring India’s military options is naivete. The government might not need to spell this out in public, but it should know it. It has been this blog’s argument that in the contemporary geopolitical environment, India’s interests are best served by being a swing power, holding the balance between the United States and China. It must enjoy better relations with each of them than they have with each other. It must also have the credible capacity to give pleasure and inflict pain. In this context, buying fighter planes from the United States would have been an excellent move. And who has New Delhi shortlisted instead? European companies. The European Union is a bit player in the international system, zealously safeguarding its own legacy position at the United Nations Security Council, the G-20, the World Bank, IMF and other places, against India. Italy is engaged in process of blocking India’s UNSC candidature. An order placed with Eurofighter or Rafael isn’t going to change its plans. EU busybodies can be found everywhere from inviting Kashmiri separatists to speak, to attending court hearings of Binayak Sen. Some small EU states almost wrecked the India-specific waiver that the United States was obtaining at the Nuclear Supplier’s Group. When it’s crunch time in Afghanistan, does anyone in New Delhi think that the EU will or can make any move that’ll safeguard India’s interests? Why is India being gratuitously generous to Europe when there is much to gain from giving the contract to the United States? Yes, France, Britain and Germany are countries that India must engage. There are ways to allow them to benefit from India’s growth process—from power projects to manufacturing to services. The fighter aircraft contract need not be awarded to European firms, because it has higher strategic opportunity costs. The downshot is that the UPA government has squandered a unique opportunity to gain leverage in Washington at a crucial time when closer ties are in India’s interests. It first took way too long to decide, dragging the procurement process even China built its own new fighter plane. It now decided to pick two vendors who might well sell a technically superior and cheaper product, but do no more than that. To put it mildly, this is strategic stupidity. Update: [April 29th] This post and related tweets were quoted in the Times of India and New York Times today. My colleague Dhruva Jaishankar has a different take over at Polaris. Offstumped has it in a nutshell. My paper, The Paradox of Proximity – India’s approach to fragility in the neighbourhood is the first of a series of papers published by New York University’s Center for International Cooperation on rising non-Western powers’ policies towards fragile states. It was prepared with inputs from Sushant K Singh, my Takshashila colleague. The risks posed by fragile states have moved to the centre-stage of Western security consciousness only in recent years, fundamentally as the result of globalisation and precipitously due to the 9/11 attacks on the United States. The threats posed by fragile states to the Western countries are palpable and proximate—for instance, in the form of terrorist plots, influx of refugees and organised crime—but their origins of the threats are relatively remote and distant. Western policymakers and publics, therefore, enjoy a certain geographical and temporal insulation, not only allowing for detached analysis but also allowing a broader range of policy options. It is different for India. Both its immediate and its extended neighbourhoods consist of several states that in the turbulence of transition, contending with institutional weaknesses, political fragility and governance failure. For India, history and proximity turn what might have been largely matters of foreign policy into a number of inter-connected issues of domestic politics. It is nearly impossible for India’s policymakers to detach the approach towards a nearby fragile state from a panoply of domestic political considerations. From a security perspective, the range and intensity of threats increases with proximity; but so too, the number of domestic political constituencies that have a stake in the game. Even within the Indian government, neighbourhood policy is shaped by a large number of agencies across federal, state and sometimes even district levels. Given that domestic policy outcomes in parliamentary democracies like India are generally political resultants of the complex interplay of political forces, there are limitations on the timeliness, coherence and effectiveness of India’s response. Therein lies the paradox of proximity: having a fragile state in the neighbourhood makes it important for you to intervene, but there are structural constraints to your ability to do so. This essay examines motivations, constraints and processes that shape India’s policy towards fragile states. It aims to show that addressing state fragility in the vicinity is a vastly more challenging project than managing risks emanating from distant ones. It begins with an overview of India’s contemporary motivations for engagement and intervention in the turbulent geopolitics of southern Asia. It identifies the various types of interventions India has engaged and attempts to derive the underlying features of India’s approach. The policy process is discussed next, analysing how drivers, constraints and players affect decision-making. We conclude with a brief assessment of how India’s policy towards fragile states, both proximate and distant, might change as India becomes a middle-income country with global interests. The Asian Balance: What if China becomes a democracy? It is extremely unlikely, but let’s say the fragrance of Jasmine flowers wafts across the Great Wall and perfumes China’s Han heartlands. A post-revolution China could take many forms, but let’s say that it turns into a democracy while retaining its existing international boundaries. Let’s set aside these two big “if’s” for a moment and ask what such a scenario would mean for India. There are three fundamental questions. Will democratic China change its outlook, positions and policies with respect to India? Will it be any easier to deal with? And therefore, is a democratic China in our interests? …it is likely that democratic China, like the People’s Republic, will see itself as the successor to the glorious empires of history (and its) geopolitical interests will not be too different from the People’s Republic’s. There is also nothing to suggest that China will stop using Pakistan and other countries in India’s immediate neighbourhood as proxies and surrogates. Even the methods might not change. After all, if the US and France sell arms to the Pakistani army why can’t democratic China do the same? Let’s not forget that the US was very much a democracy when it abetted Pakistan’s nuclear weapons programme. Will democracy make it be any easier to deal with the northern neighbour? Again, unlikely. Democracy in the eastern, western and southern neighbours has done little to transform their relations with India. Why should it be any different with China? None of this implies that a democratic China is not in our interest. From a foreign policy perspective, the main reason to prefer a democratic China is to be able to mutualise the democratic disadvantage. It is harder for democracies to doggedly pursue the quest for power. (See this post from 2006). Democracies are also more transparent. To the extent that we are familiar with Democratic China’s domestic political landscape it will be an improvement over the current situation, where we know little about the way the cards are stacked. Transparency will also make China’s politics more manipulable, and thus neutralise an asymmetric advantage that it has over India today. Author Nitin PaiPosted on 21st March 2011 Categories Foreign Affairs, Public Policy, SecurityTags Business Standard, China, democracy, India, international relations, Middle Kingdom, op-ed, Realism, The Asian Balance, Tibet1 Comment on The Asian Balance: What if China becomes a democracy? It is not hard to see why there is an enormous amount of pablum in the Western circles when it comes to figuring out what to do about the mess that is Pakistan. [See recent posts by Dhruva Jaishankar & Rohan Joshi fisking one such case]. One part is that mindsets are not keeping pace with geopolitical realities. The second part is that the reality itself is so terrible that it is far easier to avoid confronting it. This situation is possible and inexpensively maintained when you are a few thousand miles away from the reach of Pakistan’s ballistic missiles. Take Christophe Jaffrelot’s review essay in Foreign Affairs on why India is a democracy and Pakistan is not. It is a commentary on Philip K Oldenburg’s “India, Pakistan and Democracy – Solving the puzzle of divergent paths”. Both book and review devote themselves to debunking the “reductionist and not particularly productive approach” of attributing these difference to religion. To author and reviewer, it is almost an article of faith—ironically—that Pakistan’s being on intensive care and India’s longstanding democracy and recent development have nothing to do with the former being beholden to Islam and the latter driven by its Hindu civilisational ethos. So they spend a lot of time, energy and ink splitting hairs and teasing out minor variables that might have instead contributed to these starkly different outcomes. This argument, to put it mildly, is bunkum. It doesn’t explain, for instance, why the Pakistani government can’t collect taxes and electricity bills from its elite. It doesn’t explain, for instance, why Salmaan Taseer’s assassin is celebrated as a national hero. The mess that is Pakistan is the creation of the Pakistani people. Pakistan can’t be fixed by changing its ‘relationship’ with India any more than North Korea can be transformed by tweaking US-South Korea relations. This is theoretically a good argument. It would have merited attention had it been made in 1950. However, given that the China-Pakistan alliance is more than five decades old and continues to be robust, it is unclear what more India has to fear from that front. On the contrary, a Pakistan alienated from the West—like North Korea—might actually be strategically less useful to China. This is precisely the kind of conclusion you’ll arrive at if you ignore the obvious and focus on lower-order variables. Mr Jaffrelot fails to mention how democracy in India will be affected if–and that is a big if—Pakistan falls apart. Nothing bad happened to the United States and Western Europe after the Soviet Union and the Eastern bloc collapsed. In fact, it can just easily be argued that Indian democracy will be stronger if the security threats from Pakistan diminish. Mr Jaffrelot’s comment on communal harmony might have been taken as merely gratuitous if he had not left out the adjective describing “terrorist attacks”. As for BJP’s ‘Hindu nationalist policies’, we might be able to assess their their impact on communal harmony once they occur, because right now, there is scarcely one policy that can be described as ‘Hindu nationalist’. What are ‘Hindu nationalist policies’ anyway? If there is a reason why communal harmony is threatened, it is because of entitlements and identity politics that breeds competitive intolerance. We do have plenty of those policies. People who make such recommendations should be forced to put their money where their mouth is. Perhaps a charge of $1000 every time they repeat this formula will sufficiently deter analysts from offering the same, ineffective prescription. Double that if they prescribe it when “dialogue” is not only in progress but the stated policy of the Indian government. This might help reduce India’s fiscal deficit. Neither Indian democracy nor India’s development is contingent on Pakistan, its generals and their fists. It is pointless talking to Pakistan. It would make more sense talking to the powers that pay to keep Pakistan in intensive care. Unlike Mr Oldenburg & Mr Jaffrelot, we do not have the luxury of pretending that what makes us feel good is actually what is real. Does the absence of a culture of “settled rule” imply continued instability? At a time when political unrest is spreading from Tunisia and Egypt to Libya, Bahrain and other parts of the Middle East, here’s a passage from Deepak Lal’s In Praise of Empires. In his enthralling history of the fall of the Ottoman empire and the creation of the modern Middle East, David Fromkin concludes that [the unfulfilled Allied hope that they were installing permanent successors to the Ottoman sultans in the new states they had created] was due to “a characteristic feature of the region’s politics: that in the Middle East there is no sense of legitimacy—no agreement on the rules of the game—and no universally shared belief in the region that, within whatever boundaries, the entities that call themselves countries or the men who claim to be rulers are entitled to recognition as such.” This is part of a deep crisis of social and political identity, similar to one faced by Europe after the collapse of the Roman empire. In this search for a political identity, Muslims are not helped by an age-old cultural trait. The empire which the Arabs created was a conquest society, and subsequent Islamic polities have never lost their militaristic nature. The great fourteenth-century Arab historian Ibn Khaldun saw the medieval Islamic polity he observed as consisting of a settled, nonpolitical society and a tribal state, either imported or imposed by conquest. Whereas the Chinese, for instance, in their cyclical view of history saw settled rule as the norm and a change of dynasties as the result of a loss of virtue of an old tired dynasty, the Islamic polity never accepted the notion of settled rule. Ibn Khaldun considered it effeminate. This has been the black hole of the Islamic policy from its inception. The public protests in the Middle East are essentially anti-Establishment. It remains to be seen whether the resulting political transformations will prove Professor Lal wrong. K Subrahmanyam passed away in New Delhi yesterday. He was the single most important strategist in independent India. I had the good fortune of knowing him since around 2006, and he has been a source of encouragement and support to us at INI, Pragati and Takshashila. 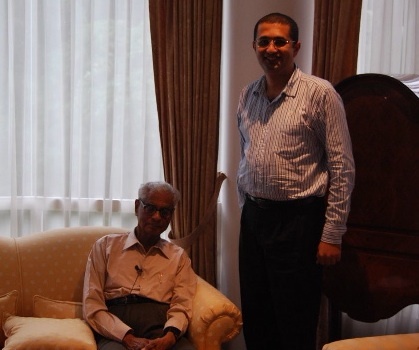 He would respond to some of my blog posts and articles over email, wrote for and gave an interview for Pragati, and, despite his age and health, turned up at the first Takshashila executive programme in New Delhi in December 2009. You should listen to the interview in his own voice. You can also download the published interview in PDF. Nitin Pai: Looking back over the decades, what would you say were the best and worst moments? K Subrahmanyam: One of the best moments was on 16th December 1971, when we achieved success in Bangladesh and the other has to be split into two—18th May 1974 and 11th May 1998, when we conducted nuclear tests. One of the worst moments was on 18th November 1962. I was then working in the defence ministry, when I came to know that Prime Minister Nehru had written to President Kennedy asking for American aircraft to operate from India soil against the Chinese. This was when India itself had not even used its own air force. The imposition of emergency on 25th of June 1975 was the second worst moment. What were the learning points from 1962? It is a learning point in a big sense. We had an army whose leadership was immature as they had been promoted too rapidly. They were incapable of handling such situations. This was true not only of military but also of the diplomatic community and to some extent it was true of politicians including Jawaharlal Nehru. He was persuaded that it would be either a full-scale war in which case other major nations were expected to support India or that it would remain as patrol clashes. That the Chinese could calibrate the operation so very carefully, mainly to humiliate him, and then withdraw, was something that did not occur to him. It was a very masterful strategy of the Chinese who took full advantage of Cuban missile crisis. Have the lessons been learnt? No. Take the liberation of Bangladesh as a case study. Pakistan held free and fair election in December of 1970 under a mistaken assumption that nobody would win a clear majority and the army would still be able to manipulate the country. I was convinced that the army would not hand over power and that we had to be prepared for problems. Then came the hijacking of the Indian aircraft that was blown up in Lahore after which Pakistani planes were banned from Indian airspace. The Pakistanis started building up troops in Bangladesh and the ships were going via Colombo. Everybody knew about it. But we didn’t do anything to warn our armed forces to be ready till 25th March 1971 when Pakistanis began the crack down (See page 21). When asked to intervene on 30th March, the Indian army requested for more time. When they got the time that they needed, they did the job beautifully well. But we did not anticipate this eventuality. Let us take Kargil as another example. In the Kargil committee report, we have said that the Cabinet Committee on Security should have a regular intelligence briefing by the Chairman of the Joint Intelligence Committee. But the government has not accepted this. There is no sensitivity to intelligence in India. The top decision-makers do not get themselves briefed on the state of affairs. They only expect to get an update if something happens. This attitude still persists and this is a major weakness. The whole attitude to intelligence needs to change. Professor Manohar Lal Sondhi used to say that since I was the chairman of the Joint Intelligence Committee, I should have nothing to do with academics! During the second world war, all the intellectuals were in intelligence. American professors used to encourage students to join the intelligence community. Even today, I see many CIA advertisements in university campuses across America. Earlier this month, after the protests in Tunisia caused the reigning despot to fly to Saudi Arabia, this blogger said that the phenomenon is unlikely to spread. In the event this was proven wrong by Egypt. Bear this in mind as you read the rest of this post. Second, look at mobile telephone and internet penetration. Mobilising large numbers of people in short periods of time requires ubiquitous access to mobile phones and the internet. This is important because state machinery can pre-empt large protests if they have enough time to identify, intimidate or imprison the field organisers. That is why Twitter (and to an extent Facebook) beat SMS text messages, and why text messages beat phone calls and pamphlets. A tweet is likely to reach any given fraction of the population orders of magnitude faster than a SMS text message. Most importantly, they work in combination—a tweet can be relayed on SMS, and vice versa. While technology allows faster mobilisation, it does not create leadership or an alternative political vision. It is not surprising that some of the recent “leaderless” uprisings do not have a clear idea of “what next?” beyond the toppling of the current regime. What this means is that organised political groups—like the Muslim Brotherhood in Egypt—can wait for the uprising to oust the incumbent, even let a transition government operate for a while, before stepping in to take over. Not unlike what the Pakistani military-jihadi complex did following the ouster of General Musharraf. Third, when it comes to the crunch, look at whether the security forces—specifically the army—will fire upon their own people. This is both a yes/no question, as well as a question of extent. In countries with compulsory military service, it is less likely that the army will fire on its own people. In countries where the armed forces are insulated from the general public—culturally, socio-economically or ideologically—then it is more likely that the army will not have such compunctions. That is why Iran has a special revolutionary guard that is distinct from the army. This is also why the Pakistani army engages in massive domestic skulduggery, because its leaders do not want to be in a situation where they have to fire at Pakistanis from the Punjabi heartland. Demographics: median age 29, (borderline) check. Mobile phone penetration 95.3%, check. Internet 4.5% no check. Demographics: median age 24, check. Mobile phone penetration 77%, check. Internet 21.1% no check. The rest is left as an exercise for the interested reader. Here’s a video of my opening remarks at a roundtable a few days ago at the India International Centre, New Delhi. It dealt with India in a globalised world and was organised by Vivek Dehejia, featuring Ashutosh Varshney (professor of political science at Brown University) and Paranjoy Guha Thakurta (journalist and documentary film-maker) in addition to me. You can watch the entire 90 minute programme on Mr Dehejia’s Vimeo page, of which the following is a short excerpt. Note: In the talk I state that Singapore has more diplomats that India. This is an exaggeration, but only just. According to Daniel Markey, Singapore has 487 professional foreign service officers while India has 669. However, not all of India’s foreign service officers are engaged shaping foreign policy or conducting diplomacy. Some of them, for instance, are passport officers.